TL;DR: 300-450 ms latency, of which I think ~150 ms comes from Republic. Send comments to my G+ post. I’ve been a customer of Republic Wireless for about 2 weeks now. I have terrible cell reception at home, so one of the attractions of their service was transparent wi-fi vs. cell calling. I expected that the voice quality would be much better over wi-fi than cell. Indeed it is, but what I hadn’t anticipated was high latency. From my very first call, the lag was very noticeable. Like a bad overseas call, the other party and I on the call talked over each other and had awkward pauses. Switching to cell (which happily Republic lets you toggle manually mid-call) the lag nearly vanished, but audio quality plummeted. But how bad is the lag? I needed to quantify it. To do so, I made a recording of me calling my other line. 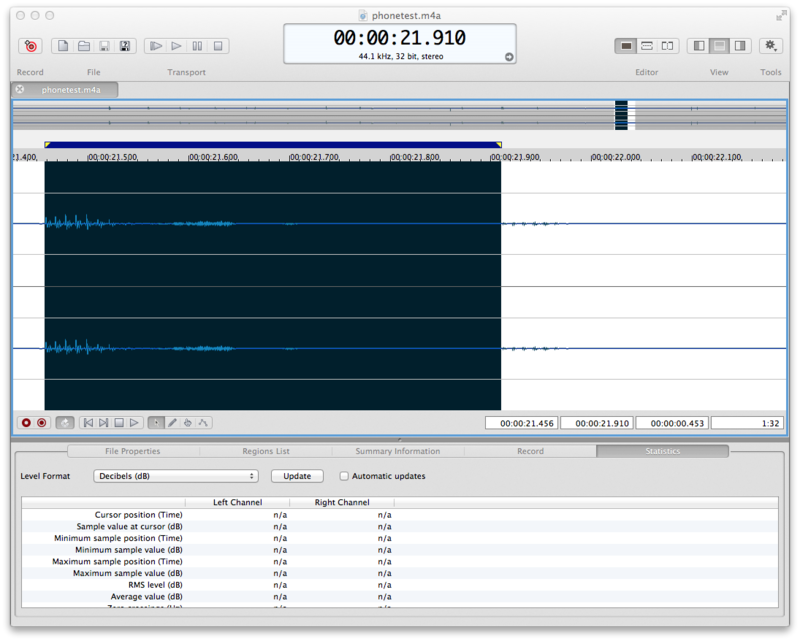 Then I dragged the m4a recording into Sony Sound Forge Pro (yes, I’m shilling for my employer just a tiny bit). I isolated several segments of audio where I could hear myself talking and then hear the result from a handset a fraction of a second later. To measure the latency, I simply highlighted from start to start of the same syllable and looked at the selection duration. Here’s a screenshot showing Sound Forge with a span selected from the beginning of me saying “Test” to the beginning that “Test” coming out of the handset’s speaker. Note the “00:00:00.453” duration of the selection. The final result is that the lag from cell to landline is about 300 ms. The lag from landline to cell is about 450 ms. So a conversational round trip totals to a minimum of 750 ms.
Republic’s wiki recommends using a ping/jitter test to validate your WAN connection. I ran this one: whichvoip.com speed test, which requires Java. That report says I have 3.8 Mbps down, 545 kbps up, 96 ms RTT, 66 ms max delay, 0.1 ms jitter, 0% packet loss, and MOS of 4.2 (nearly “toll quality”). That is to say, my network appears to be capable of much better results than I’m achieving. If you subtract 96 ms packet RTT for my network from the 300 or 450 ms voice delay that I measured, you still have about 200-350 ms of delay. There are certainly contributions from multiple sources: the audio compressor, my wi-fi, my DSL uplink, the WAN, Republic’s servers, the PSTN/POTS network to my landline, and the hop to my cordless landline handset. Lets make some guesses about the latency budget. my DSL uplink at ~500 kbps is slow enough to matter. If the VOIP audio stream plus overhead is, say, 80kbps (which is a reasonable guess vs. the PSTN rate of 64 kbps) time-divided into 20 ms packets, then each packet is about 1.5kb which takes about 3ms to transmit. Again, pretty negligible. Republic’s servers are a black box. Wikipedia suggests that PSTN/POTS voice networks strive to keep latency under 100 ms. So lets pick that number. No idea about my cordless 2.4 GHz landline. I’ll guess it’s negligible because I don’t hear delay in normal local calls. Without #5, that adds up to ~200 ms. So that means that Republic is likely adding 100-250ms to the path. I’d love to hear from Republic to learn about their infrastructure. Is that an expected number? Is there hope for improvement?